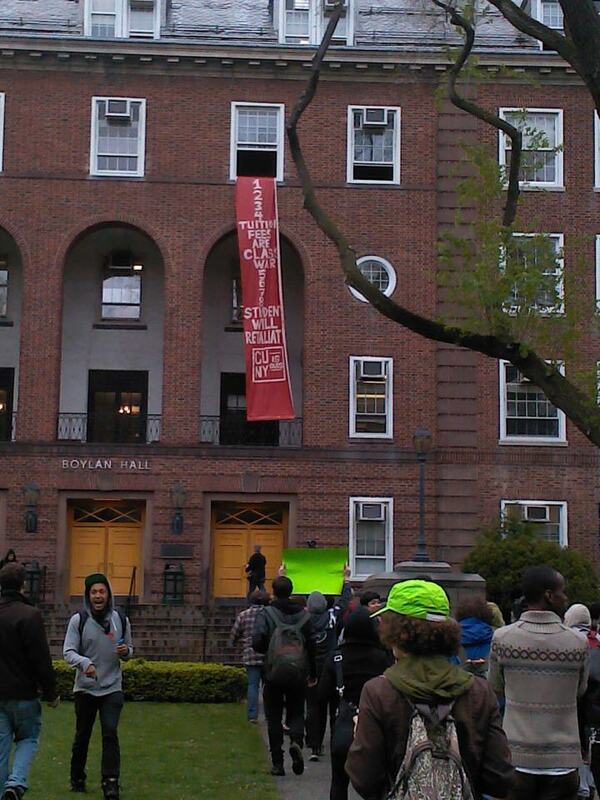 On May 2nd, 2012, peaceful students and faculty experienced unnecessary brutality on the Brooklyn College campus. Brooklyn College President Karen Gould ordered for students to be violently removed by campus security from outside of her office in a main academic building; two students were wrongly arrested, spent a night in jail, and face unsubstantiated charges. Over the next five years, students face a $1,500 tuition increase, and continuous cuts to student services and a continuation of increased securitization on CUNY Campuses– from the NYPD systematic spying on Muslim Student Associations, to Stop and Frisk racial profiling policies on and off our campuses, to attacks by security guards on peaceful students such as during the Board of Trustees Meeting on November 21st, 2011 at Baruch College. We refuse to allow these violent acts to become the future of CUNY. 1) President Gould of Brooklyn College drops ALL charges against Eric Carlsen and Julieta Salgado, two peaceful Brooklyn College students arrested for demonstrating outside President Gould's office on May 2nd against tuition increases and cuts to student services. 2) The end to the securitization of CUNY. 3) The repeal of NY SUNY 2020, which increase tuition by $1,500 over five year. On May 2nd, 2012, peaceful students and faculty experienced unnecessary brutality on the Brooklyn College campus for sitting down in front of the President’s office demanding to meet with them. Brooklyn College President Karen Gould ordered for students to be violently removed by campus security from outside of her office in a main academic building; two students were wrongly arrested, spent a night in jail, and face unsubstantiated charges. Over the next five years, CUNY students face a $1,500 tuition increase. At the same time as cuts to student services and increased securitization on CUNY Campuses-- from the NYPD systematic spying on Muslim Student Associations, to Stop and Frisk racial profiling policies on and off our campuses, to attacks by security guards and NYPD on peaceful students at the Board of Trustees Meeting on November 21st, 2011 at Baruch College. We refuse to allow this to become the future of CUNY. Building off the momentum of May Day, today, May 2nd 2012, over a hundred NYC/CUNY students converged on Brooklyn College campus demanding an end to the recent tuition hikes, militarization, and NYPD surveillance on CUNY campuses. After dropping a 50 foot-long banner that read, “1-2-3-4 Tuition Fees are Class War, 5-6-7-8 Student will retaliate!”, students marched into Boylan Hall, up to the second floor, and outside of Brooklyn College President Karen’s Gould’s office. Demanding that the President speak with them, and emphasizing that al other legitimate means of addressing their grievances had been ignored, a handful of students held a sit-in in peaceful protest with arms locked in front of her door. In retaliation, CUNY campus security and NYPD officers, as instructed by President Gould and the CUNY administration, dragged the students apart from each other and proceeded to use excessive force: pushing, shoving, and deliberately suffocating students so as to disperse them. Multiple students report being punched in the face and abdomen by campus security guards. The campus security went so far as throw the cane of a disabled asthmatic student, Cecelia Adams, who screamed “I am hurt, this is why I have this cane”. After throwing her cane across the room, security proceeded to kick her and scream at her. At least one faculty member was trapped and shoved between security officers repeatedly. Two students were arrested from the group as part of this action, one of whom was dragged and dropped down stairs and across the campus grounds. Over the next five years, the CUNY Board of Trustees and the New York State legislature is implementing a $1,500 tuition increase. Students, faculty, and staff are now regularly intimidated and harassed for peacefully assembling. In the aftermath of CUNY campus security and NYPD brutality at Baruch College on November 21, 2011, this repeated endangerment of students and faculty at Brooklyn College demonstrates that violent force upon nonviolent gatherings is not exceptional, but an increasingly standardized repression at CUNY. #M1 took many forms across the state. Here is coverage of NYSR affiliate campus actions from New York City to Buffalo. #M5Yesterday’s #M5 action was a massive convergence on the state capitol in Albany, NY. Hundreds of students from SUNY, CUNY, and Albany-area high schools turned out, supported by educators, parents, and concerned community members. 33 people took arrests in a peaceful sit-in outside Governor Cuomo’s office. The action took place simultaneously with a similar action in Sacramento, CA, as UC and CSU students, faculty, and supporters descended on the California state house. 68 people took arrests in peaceful demonstrations there, making the total number of higher ed arrestees 101. 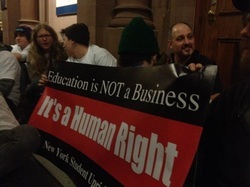 Today's action was incredible thanks to the tireless work of our organizers here at Students United for a Free CUNY. Unsurprisingly, no politicians save for Council Member Charles Barron showed up to sign our pledge to defend and restore funding to public education. Take a look below for pictures, video, media coverage and copies of the State of the Students Address and the Pledge to Defend and Restore Funding to Public Education Below, along with testimony from the press conference. See you on March 5th! New York, February 20, 2012 - As a result of Governor Cuomo's State of the State and Mayor Bloomberg's State of the City, many students in New York City feel abandoned by representatives and disillusioned by the lack of prioritization of education on the political agenda. The State of the Students public address, hosted by Students United for a Free CUNY, plans to change the current dialogue, challenge the rhetoric and shed light on the horrible direction New York City public education is going, from K to CUNY, in order to reverse it. In light of the recently imposed CUNY tuition hikes, school closures and further overcrowding, many students feel like their pleas have gone unanswered and their voices have been unheard- or rather, silenced. “They blame our teachers, our professors and budget deficits for the shortcomings of the New York public education system,” said Samuel Gompers High School student Sony Cabral, whose school is slated to be closed this year, “but it’s time we expose that the real deficits are in their political processes which prioritize the rich over working class students, parents, and teachers.” The continued divestment and privatization of public education has had extreme effects on the accessibility to and quality of education for working-class people. 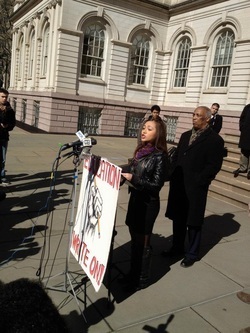 “Many students in CUNY are burdened with more responsibilities than previous generations. Overall, these students work either full-time or part-time, often raising families as they work towards their degree. This is not just a student issue, but also a family and community issue.” explained Julian Guerrero, a student at Hunter College.